The next Swiss Juggling Convention 2007 will be in Einsiedeln, (Kanton Schwyz), in the german part of Switzerland. - From Friday the 15 to Sunday the 17 of June 2007. - In Einsiedeln, (Kanton Schwyz), in the german part of Switzerland. - Einsiedeln is a very small town, where you can go from one place to another by foot. 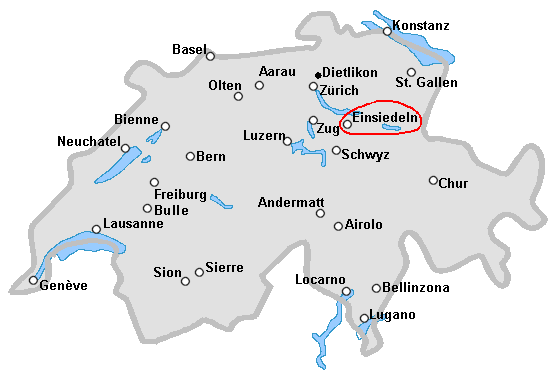 A map of Einsiedeln. With Google Earth, look : "Einsiedeln, Switzerland". - It will be possible to sleep in a camping or in the "protection civile" a king of bunker (price 15.- CHF). Come with a sleeping bag. Many shops (Migros, coop, etc.) can be found 5 minutes walking from the site. - On sunday, bakers and other smaller shops will be open. Food will also be sold on the juggling place. - fire show at 23:30. Free fire spinning maybe before and for sure after the show. Business Meeting, discussion about the future at 16 o'clock.